Volkswagen promises to improve the active interface between SUV and car with the Tiguan, and has thankfully have dropped the Fauvist exterior color choices and 30-inch hoops. Along with plenty of off-idle torque from gasoline or TDI engines, the Tiguan will nearly automatically park itself with park assist, and exhibit van-like interior cargo room. A Haldex 4motion awd system sends power to the road or rock. Come on, Rabbit. Let's you and me bounce. Full and entertaining press release after the jump. * Wolfsburg, 11. September 2007. Volkswagen is showing the new Tiguan in a world premiere at the International Motor Show (IAA) in Frankfurt. This "small brother" of the Touareg can be recommended to all those car drivers who enjoy the individual visual appearance and versatility of a SUV, but also expect a premium level of comfort, agility and variability. Its chassis sets new standards in the world of SUVs, because i t is extremely driving-active and safe. All five engines - for the first time on the global SUV market all engines are charged without exception - already deliver, powerful propulsion just above the idling speed. Today, the completely new and very quiet common rail TDIs already satisfy the Euro-5 standard that does not go into effect until 2009. Upon request, the Tiguan can be parked nearly automatically in the urban jungle by the Park Assist feature. Off-road, on the other hand, the latest radio-navigation system (RNS 510) navigates its occupants back to civilization using its off-road function. Meanwhile, with up to 1,510 liters of cargo space, the Tiguan exhibits van qualities. 2,500 kilograms of trailer load also define the absolute best value in the Tiguan segment. * Very intentionally, Tiguan - offered in the equipment versions Trend&Fun, Sport&Style and Track&Field - is being offered in two body variants: The Trend&Fun and Sport&Style versions were specifically designed for primarily on-road use. Their agile, safe and highly comfortable driving behaviors are equal to those of a car. At the same time, these Tiguans do not shy away from either off-road drives or trailer loads. They leave the really rock-tough off-road routes to the Tiguan Track&Field. * The Tiguan Track&Field was specially designed for life off of the asphalted trails. Different than the Trend&Fun and Sport&Style versions, this especially adventure-friendly Tiguan exhibits a more extreme entry angle (28 instead of 18 degrees; maximum angle without the vehicle impacting the trail in front). As standard equipment the Tiguan Track&Field also has a newly developed off-road mode that awakens an entire armada of assistance systems to make drives off-road especially safe. * As already outlines, the Tiguan is the first SUV in the world to be offered exclusively with charged engines. The advantage of engine charging: More power, less fuel consumption and lower emissions. Take the example of the gasoline engines: There will be three new TSIs - direct injection engines with turbocharging or turbocharging plus supercharging. The four cylinders deliver 110 kW / 150 PS, 125 kW / 170 PS and 147 kW / 200 PS. Take the example of the diesel: A completely redeveloped generation of noticeably quieter common rail four cylinder engines is being employed here. The two TDIs output 103 kW / 140 PS and 125 kW / 170 PS and smash the Euro-5 emissions standard. * Full-time all-wheel drive is absolutely essential off-road. On paved streets an intelligent all-wheel drive also improves active safety. In the Tiguan the latest generation of 4MOTION all-wheel drive is used. It is shifted by manual, or optionally automatic, six-speed transmissions. Both transmissions satisfy special off-road requirements. The manual transmission can be driven at an engine speed of 1,000 rpm or vehicle speed of just 6.69 km/h, for example; this practically equals the crawler gear of a reduction gearbox. The automatic transmission has gear level preselect; in off-road use it prevents shifting to the next higher gear. 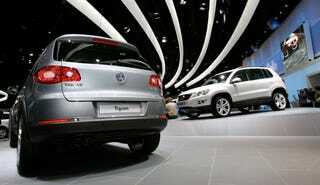 * The Tiguan is an all-round talent. This characterization not only describes its powertrain properties, but also the multivariable and very spacious interior. The rear bench seat is split with a 60:40 ratio, it can be adjusted 16 centimeters in the longitudinal direction, and the rear seatback has multiple tilt adjustment settings. This provides either more legroom in the rear or additional space in the cargo area. Available as an option is a double cargo f loor including cargo management system. Also standard on the Tiguan Track&Field and Sport&Style is a folding front passenger seat so that very long objects can be stowed. With regard to the seat position, the passengers travel exceptionally comfortably, not only in front but also in the rear. The reason: Similar to the case in a movie theater, rear passenger seating is a bit higher and therefore more relaxed. * On board an SUV for the first time is the Park Assist feature, with which the Tiguan turns into a parking space nearly automatically and impressively. The off-road mode already mentioned is a technology show; no other SUV in the world can call upon such a network of safety systems off-road at the press of a button. The Tiguan also exhibits its mastery when it comes to trailer load: It may range up to 2,500 kilograms, which is handled by the new, swiveling trailer hitch. In a class by themselves are the touchscreen radio and navigation systems; the top model (RNS 510) offers a standard 30 gigabyte hard disk memory, an off-road navigation mode and rearview camera. Any of the passengers can also look through a panorama sunroof at the sky of the savannah or the city.